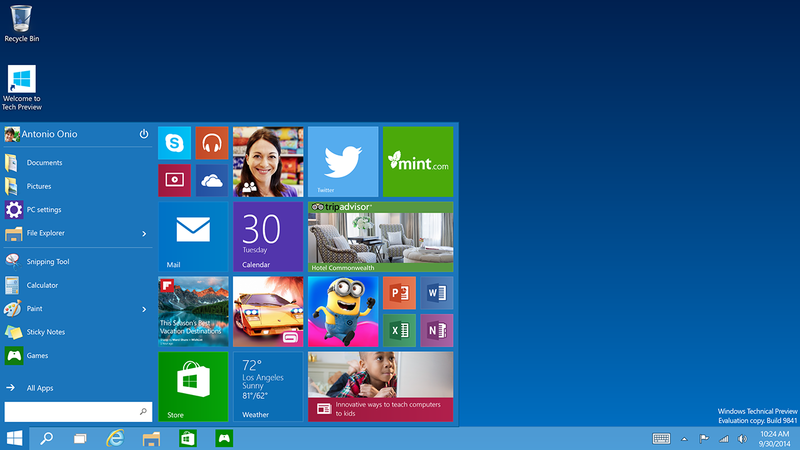 Windows 10 was just announced and one of the biggest features is its hybrid Start Menu. Many users moving from Windows 7 to Windows 8 found the full screen Start Menu too confusing. Microsoft resolved this by combining the best features of both the Windows 7 and Windows 8 Start Menus. On the left, you’ll have your most recently used apps listed as they are in Windows 7. To the right, you can pin Windows 8 apps, which features animated Live Tiles that give you up-to-date information as it happens. Universal search is still included but is more obvious now. Windows 8 users could activate universal search by activating the Charms Bar and clicking the magnifying glass button or simply by typing. In Windows 10, universal search is located at the bottom of the Start Menu, and pulls in information from the web in addition to looking for apps and files on your computer. The Shut down, Sleep and Log off buttons are also shown in the Windows 10 Start Menu. In Windows 8.1, users had to go into the full screen Start Menu or right click on the Windows icon to access these features. Now the buttons are located at the top next to your name.